Excellent conclusion to the series! - "Seasons of Tomorrow"
I have really enjoyed Cindy Woodsmall's Amish Vines and Orchards series! These books were not the "typical" Amish romance stories and I just loved everything that was a part of it - the romance, the family relationships, the mystery. "Seasons of Tomorrow" is a well-written and wonderful conclusion to this series. Rhoda has gone through much and has faced opposition, faced her own fears and pursued her dreams. The King family has gone through much as well and yet that family tie always come through strong. This is a wonderful series of family, facing fears, having faith and starting over and one that fans of Amish fiction do not want to miss out on! I highly encourage you to check out Cindy's website! It is beautiful and filled with information about new books, all of Cindy's previous books, has recipes and wonderful tidbits of information about the Amish culture! You can also connect with Cindy on facebook! This book is AWESOME! "The Manual To Manhood" is a must-have for every teenage boy (although I have to admit that I learned a few things myself from reading it!). Jonathan Catherman has written the perfect book for teenage boys as it will teach boys much needed skills for being on their own, for being in a relationship and for overall living a comfortable life. This book/guide is divided into well-defined sections and then further divided into chapters that focus on one aspect of the section. For example, there is a section on money management and one of the chapters in this section addresses how to build up a savings account and another chapter is on managing a credit card. Each and every lesson in this book teaches a valuable skill and it is very straightforward and explicit as it tells exactly what is needed and step by step instructions. I was very intrigued when I was offered this book to review and I loved it! My son is turning four this summer, so I know that it will be awhile still before he will need to know these skills, but this book will act as a guide for what he needs to be taught in upcoming years! "This rapturous novel starts with one of the most heinous shootings in history, yet every page shines with life. Crook follows three students who endured the tragedy as they grapple with the past, struggle to navigate their futures, and discover that who and what saves us is nothing like what you imagine. Brilliantly realized and so vivid the novel seems to virtually breathe, Monday, Monday is a stunning achievement." "Elizabeth Crook has written an extraordinary novel -- an eloquent love story born from an act of random violence, a tale of destruction and redemption. It's about making a whole life out of a damaged one, and about holding on and letting go. The characters are as real as people you know; their story is subtle, startling, and wise." "Monday, Monday begins by throwing us into the midst of one of the worst mass murders in American history, a scene painted with such harrowing exactitude that it leaves you wondering how the characters can possibly survive and how the author can possibly sustain such a high level of narrative momentum and emotional insight. And yet Elizabeth Crook pulls it off. This is a brilliant and beautiful book." Elizabeth Crook has written a story that will pull you right into the story and keep you there until the very end of the book. "Monday, Monday" is a story of three individuals and how their lives completely changed and became intertwined with each other as a result of a mass murder. Elizabeth has written a novel charged with emotion, and has brought the events and characters to life. Although, the novel involved a difficult subject, it is written in a style that is easy to read and thoroughly engaging. The strength that these characters have will leave the readers feeling hopeful about life and will leave them thinking about the story long after the book is finished. 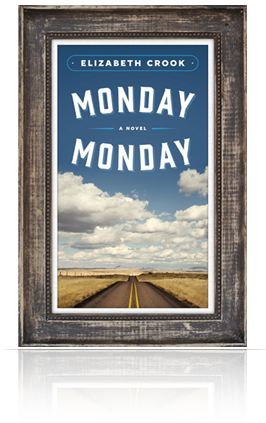 Click here to read an excerpt from "Monday, Monday:" excerpt! "Just 18 Summer," written by Rene Gutteridge and Michelle Cox, is a well-written book that is needs to be on a must-read list for all mothers. This book is eye-opening, thought-pondering and one that I will remember for a long time as I savor moments with my own two children. Four families face the truth that they are given a limited time with their children as a family after Butch's wife Jenny passes away. This is a women whom they are all grieving the loss of, but her passing also causes them to reflect upon their own lives and families and making the time that they do have together count. I find this book to be very well-written and love that there are four families that are focused upon and the story is told from each of the family's view points. Each family is different obviously and are in various stages and points in life, yet they each have the same thought of making the time together count instead of being caught up in just living life. 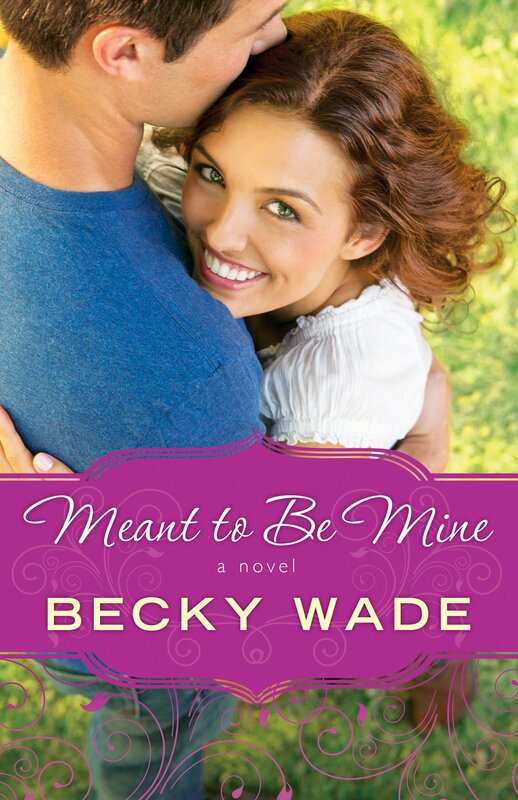 "Meant to Be Mine," book 2 in Becky Wade's Porter Family series, is a must-read for any romantic Christian fiction fan! This is a fabulous book, one that I finished within two days because I could not put the book down, but at the same time I did not want to finish because it would mean the book was done. Ty and Celia have known each other for years as they went to school together, and then when they meet up again a few years later and after a few days wild romance they marry in a Vegas chapel. However, after a change of heart in the morning, they have no contact for 5 years. Celia cannot let go so easily though as nine months after their wedding night she gives birth to a baby girl. Throughout these five years apart, Ty is very successful with pursuing his rodeo dream; yet Celia's dream is put on hold as she is caring for her daughter. However, Ty cannot forget Celia and searches for her which completely turns his world upside down when he discovers that he has a daughter. As Ty comes to terms with this, Celia must come to terms with her feelings and how her life is going to change, especially being taken care of when she is very independent and used to doing things herself. I absolutely fell in love with this book and all of the characters (well except for Tawny!). I loved the first book in the series and thought that would be hard to beat, but this one is just as good! Ty and Celia were wonderful main characters, they were faced with challenged, they grew and developed as characters and were just wonderful to spend time with. I loved how the Porter family pitches in to help, and how accepting they are to Celia and Addie and Uncle Danny's antics. Celia is forced to give up some control, face her fears and give her trust not only to an "imperfect" human, but to God as well. I am looking forward to the third book in this series and cannot wait to revisit this family! "Meant to Be Mine" is in the top 5 of my favorite books, highly recommend this, but also encourage you to read book 1 in the series first! "A Beauty So Rare," a wonderful Civil War Era story! "A Beauty So Rare," book 2 in Tamera Alexander's Belmont Mansion series, is filled with romance and secrets and the pages are oozing with vivid descriptions that bring this time period and story to life! Eleanor has never considered herself to be a beauty, a Southern Belle, but merely a strong individual whom loves her family, cares about others and tries to do what's right. As Eleanor is forced to get care for her father, she accepts her aunt's offer to live with her at Belmont Mansion. Aunt Adelicia Acklen's plan is to find the perfect match for Eleanor so that she is cared for and lives the comfortable life; however this is not Eleanor's dream, but it is one that she succumbs because she feels she must. When Eleanor arrives at Belmont, she meets Marcus. Marcus works at Belmont Mansion as a gardener and has a love for working with plants and he is grafting plants and trying to make them stronger. However, he has secrets that he is hiding as does Eleanor. Eleanor loves to cook and bake, but that is looked down upon in society; why would Eleanor want to cook for others?! "Just thinking of it again tempted Eleanor to smile. That was the point in the conversation when the knot in the pit of her stomach that had bound her almost since the first day she'd set foot on the Belmont Estate again, had slowly, but most certainly, begun to unfurl. Freeing didn't even come close to describing it. It was a feeling she wanted to cling to- and she knew the recipe for doing just that. Although she'd suspected her aunt was going to like that news even less than she had this." Eleanor has felt "stuck," not living her life how she wants to (including wearing pink!) and this was a moment I loved in the book as I could feel the relief oozing through Eleanor as she is feeling free and life is finally turning in the direction that she wants it to be, the life that she wants to live. I highly recommend this book for historical fiction fans! Tamera has the romance in this for all of us whom enjoy that piece of our books, but she also addresses subjects that are not often written about, including dementia and botany. Also, I loved Eleanor's passion for cooking and baking as I love trying out new recipes and enjoy being in the kitchen as well. This is a book that you do not want to miss out on! 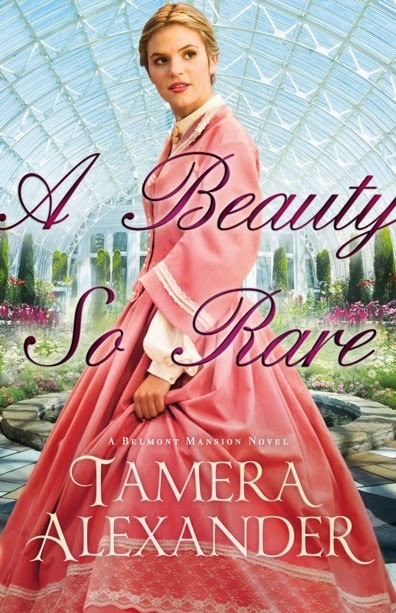 Write Perspectives with author Tamera Alexander: Pinterest Scavenger Hunt: Join me for a Pinterest Scavenger Hunt and win 1 of 7 copies of A Beauty So Rare, the second standalone novel in the Belmont Mansion series! "A Sensible Arrangement" is the perfect title for Tracie Peterson's latest (and her 100th!) novel, as that is something that both Jake and Marty are seeking. Marty is seeking to move on with her life and not live with the memories that she has been for the past few years since her husband passed away. Jake is expected to be married and have a perfect wife on his arm at social events. Marty responds to Jake's advertisement and this marriage seems to be the answer for both of them. However, of course things do not go according to plan and the relationship changes in ways neither expected. This is a great story and I am looking forward to the second one in the series! The setting is well-described so that I felt as if I was truly a part of a story. The historical details add so much to the story as well and I love books that bring history alive. The main characters are flawed as each of us are and I felt that it made it easier to connect with them and really empathize with them throughout the story. While I really liked both Jake and Marty, I also enjoyed the minor characters in the story as well, especially Alice and the role that she plays in Marty's life. I recommend this book to historical fiction fans and am looking forward to reading the rest of this series! About the book: After her father's death, Mariah Malone sends a letter that will forever alter the lives of her family. When Slade Donovan, strong willed and eager for vengeance, shows up on her front porch, Mariah is not ready to hear his truths: her father's farm, the only home she's ever known, was bought with stolen gold. With Slade ready to collect his father's rightful claim and force Mariah and her family out on the streets, Mariah must turn to God for guidance. Though Mr. Frederick Cooper, a local landowner, promises to answer her financial woes if she agrees to be his bride, Mariah finds herself drawn instead to the angry young man demanding her home. About the Author: Pam Hillman was born and raised on a dairy farm in Mississippi and spent her teenage years perched on the seat of a tractor raking hay. In those days, her daddy couldn't afford two cab tractors with air conditioning and a radio, so Pam drove the Allis Chalmers 110. Even when her daddy asked her if she wanted to bale hay, she told him she didn't mind raking. Raking hay doesn't take much thought so Pam spent her time working on her tan and making up stories in her head. Now, that's the kind of life every girl should dream of! "Claiming Mariah" is a sweet romance by Pam Hillman which is filled with secrets, suspense and love. Pam dives right into the story and action on the very first page with the two Donovan brothers showing up at Mariah's home to claim the ranch as theirs due to the past between their fathers. Mariah has been living on her family's ranch with her grandmother and she cannot believe the truth; however Mariah is concerned of her father's reputation and carrying for her grandmother and sister. As Slade Donovan comes involved in Mariah's life and in the ranch, secrets are uncovered and things may not be as these two individuals have perceived them to be. As Mariah seeks God's guidance she can feel His leading, but she is not prepared for what all is to come. This is such a sweet story and one that is filled with action and loveable characters that I was immediately engrossed in and did not want to stop reading! There are things that are uncovered and past issues that need to be dealt with and so much growth and changes for these two main characters that you cannot help but become completely involved in their lives. I highly recommend this historical romance set on a ranch as it will draw you into the story and on a journey with these characters. Tracy L. Higley’s THE QUEEN’S HANDMAID Kindle HDX giveaway! About the book: From the servant halls of Cleopatra's Egyptian palace to the courts of Herod the Great, Lydia will serve two queens to see prophecy fulfilled. About the Author: Tracy L. Higley started her first novel at age eight and has been hooked on writing ever since. She has authored many novels, including Garden of Madness and So Shines the Night. Tracy is currently pursuing a graduate degree in Ancient History and has traveled through Greece, Turkey, Egypt, Israel, Jordan, and Italy, researching her novels and falling into adventures. Wow Tracy L. Higley has done it again - "The Queen's Handmaid" is historical fiction at it's best! Transported back in time to the year of 39 BC in Egypt, we meet Lydia, an orphan whom is uprooted from the only home she has known and become intertwined in Herod's household, a mission and danger. This book is packed full of historical details and vivid images making the setting and the characters come alive in the pages. Tracy has a way with bringing history to life and helping her readers to feel as if they are a part of the characters' lives and experiences. This is an exciting novel that is filled with secrecy and twists and turns, along with complicated relationships as Lydia is trying to fulfill her mission. Once you begin reading, you are not going to want to stop! I love that Tracy has included family trees at the beginning of the novel as this helped me keep the characters straight as to their connections and relationships throughout the story. I highly recommend this book to those whom enjoy historical fiction set in Biblical times! To read other reviews included on this book blog tour go here! Mom Seeks God by Julia Roller offers a highly relatable story and useful advice to help new moms grow in their faith as they address life changes with grace, patience, and prayer. As readers discover ten essential faith practices, they’ll learn that motherhood itself is a spiritual discipline and can be God’s most effective technique for forming a more Christ-like life. Julia is celebrating the book's release with a fun giveaway and connecting with moms during a live Facebook author chat. Enter today by clicking one of the icons below. But hurry, the giveaway ends on May 1st. Winner will be announced at "Moms' May Day" Facebook Party on May 1st. Connect with Julia for an encouraging discussion on spiritual discipline and finding joy in the middle of motherhood. Win prizes, connect with other moms, and be inspired. Don't miss a moment of the fun; RSVP today. Tell your friends via FACEBOOK or TWITTER and increase your chances of winning. Hope to see you on the 1st! About the book: The first months and years of motherhood can be the most challenging and disorienting of your life---and faith. When you're surrounded by the happy chaos of children, how do you spend quiet time with God if the only quiet time you get is while you sleep? How can you demonstrate a solid spiritual life to your children if you don't have time to pursue one yourself? When Julia Roller discovered that her spiritual growth had been stunted by the busyness of life with her toddler, she embarked on a yearlong journey through ten spiritual disciplines: prayer, fellowship, submission, study, simplicity, silence, worship, fasting, service, and celebration. As she focused on each discipline, she discovered practical ways to observe them---even in the chaos of her every day. About the Author: Julia Roller is an author and editor. Her books include Mom Seeks God (Abingdon Press), A Year with God (with Richard J. Foster), A Year with Aslan, and 25 Books Every Christian Should Read. Working with Renovaré, she has also co-authored four spiritual formation guides. She has written study guides for authors such as Desmond Tutu, Richard J. Foster, Henri Nouwen, Jenna Bush, and Rob Bell. Her articles have appeared in The San Francisco Chronicle, Street Spirit, Group, Rev. !, and Children's Ministry. She and her family live in San Diego, California. Being a mom is so rewarding, but it is also nonstop and can be extremely stressful and tiring leaving no energy for anything else including prayer and taking care of one's spiritual well-being. Julia's book "Mom Seeks God: practicing grace in the chaos" is breath of fresh air and encouragement for each and every mom. Julia is straightforward and yet has a sweet conversational tone that immediately draws the reader into the book. This is a book that is filled with ideas and encouragement for dealing with the chaos with God's help and keeping Him a part of one's daily life. What I love about this book is that it is practical and encouraging; meaning that I don't feel as if it would be a losing battle to make changes in my life. I love the tips included at the end of the chapters and look forward to implementing them. "What Follows After" is the latest novel from Dan Walsh and this is one not to be missed! Not only will you be completely engrossed in the story, you will be thinking of this story long after you finish reading as well. Scott and Gina have been living a lie and have their sons, Colt and Timmy lying along with them. Colt has had enough of the lies and the life they are all living and he devises a plan for he and Timmy to teach their parents a lesson. However, things do not go according to plan and Scott and Gina are forced to reevaluate their lives and their choices. This is an excellent book, (although I think I say that about everything by Dan Walsh! ), but this really is! Dan does such a great job at creating stories that are so real and so engaging and thought-provoking. The characters and their struggles and emotions are so real and life-like that it is so easy to relate to them and be caught up in their world. I highly recommend this book for men and women to read, you will not be disappointed! Featured recipe from Tamera Alexander's latest book - "A Beauty So Rare"
Win a NEW Spring Wardrobe from Quilts of Love | “Maybelle in Stitches” Giveaway! I have absolutely been loving the books in the Quilts of Love series that I have read and love this latest addition to the series! "Maybelle in Stitches" is a story that had me laughing, anxious and totally immersed in the story and in Maybelle's life. Set during World War II, I was transported back to this time and how life was for women at home waiting for their loved ones to return to them and dreading receiving bad news. Joyce does an excellent job with recreating this time period in the book and bringing history alive. Maybelle is a loveable main character and one I enjoyed spending time with. Maybelle is not a sewer or quilter and yet attempts to complete the quilt that she finds; I love the meaning behind the quilt, the pieces that make up the quilt and how quilting helps Maybelle through this trying time. I highly recommend this book to fans of historical fiction and I would encourage you to read this book even if you are not familiar with this series as this is a stand-alone novel as well. "A Broken Kind of Beautiful," written by Katie Ganshert, is a beautiful, soul searching story that will touch your heart and stay with you long after you finish reading it. Ivy is broken, she feels broken inside, yet she has done an excellent job of hiding behind a put together and beautiful, unbroken, façade. Ivy's parents were not exactly there for her growing up and when she has a chance to model, she takes it. This eventually leads her to a small town in South Carolina to be the new face of a bridal line and also into the world of Davis Knight. Davis has secrets of his own and he is hiding behind his camera lens; and he seems to see through Ivy's façade and this begins her façade cracking and Ivy rethinking her worldview and her own worth. Ivy is on a journey and it is a beautiful and heart-wrenching one. There were so many times while reading this book that I wished I could sit down and talk with Ivy over cups of coffee and be a friend to her; she was so real and I wanted to help her. Katie has done another fabulous job with writing fiction that is so real, thought-provoking and heart-wrenching. The journey Ivy takes to God and discovering His love and her worth to Him is one that I am so glad I was able to become a part of. I highly recommend this book, and Katie's other novels as well. And if you cannot wait to get started reading this book, go here to read chapter 1: here! I have enjoyed reading novels by these authors, so I was thrilled to have the chance to read and review this novella collection! "Sincerely Yours" is a collection of four stories, four stories that are all well written and with four heroines whom you will enjoy spending time with! Due to a letter from someone, each of these four women find their lives changing and also at the same time finding love. I enjoyed each of these novellas and the fact that even though the stories are shorter than novels, they do not lack any details or fall short of full length novels as the authors have done a fabulous job with bringing the time period in each story to life. The details and descriptions set the scene so well and I felt right at home with each of the women. This is a collection that every historical romantic fiction reader must read!